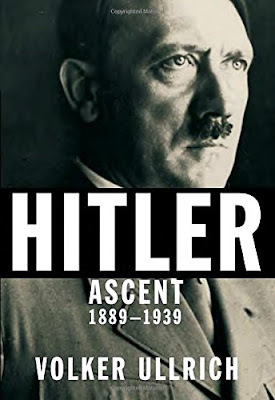 Veteran journalist and author Joseph C. Goulden offers a good review in the Washington Times of Volker Ullrich's Hitler Ascent: 1889-1939. Even at decades removed, historians remain fascinated with the why — and how — of Adolf Hitler’s rise to evil power, and the role of the German people in his horrendous assault on mankind. Many splendid works already exist, beginning with Alan Bullock’s 1952 masterpiece, and more recently, a two-volume work by Ian Kershaw in 1998 and 2000 (all of which I have read). Now comes the German scholar/journalist Volmer Ullrich, with the first of two planned volumes, which offers keen insight into how Hitler perfected demography to sway audiences into hysteria. And Mr. Ullrich displays an insight into the making of Hitler that I did not find elsewhere. Although his podium voice was shrill and unremarkable, Hitler displayed an ability to exploit the anger of a populace who felt they had been betrayed by their own leaders in war, and suffered from an unjust peace imposed at Versailles by the victors.